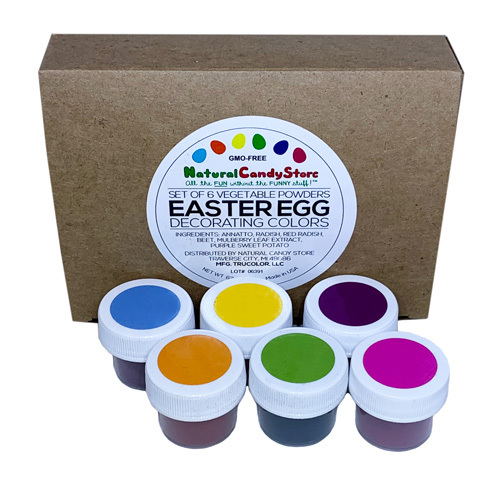 This set of 6 natural food color powders (pink, purple, blue, orange, yellow, green) is specially designed for eggs to give you fantastic results! * Just dissolve dry powder in water and let egg soak for a minute to enjoy beautiful results without exposing your family to yucky artificial dyes! Set includes complete instructions with a fun water coloring activity for after the eggs are decorated. We've worked closely with the natural color experts to make these colors the best natural egg decorating colors around, adding a beautiful orange, an awesome improved blue, and a great green that sticks much better. The result is six distinct, true colors for a beautiful Easter palette. These are the brightest and prettiest natural food colors for egg decorating you will find anywhere! *Note: We carry a large assortment of other natural colors. While highly recommended for baking projects, the other colors are not designed for decorating eggs and may not stick to the shell. That's why we put this special set together—to make sure you get the best possible results for Easter! Purple: Red Radish, Organic Tapioca Maltodextrin. Note:Organic Tapioca Maltodextrin is non-GMO and is used as a processing aid; Sodium Bicarbonate, Calcium Carbonate or Citric Acid is derived from non-GMO cane and/or beet (NOT corn) and is used to control pH. Misc. info: Dry powders last a year or more when sealed and stored in a cool, dark place. In the freezer, they may last longer. Hydrated colors are best used immediately, but may be kept in the refrigerator for a few days or frozen up to 6 months. Each set contains 6 small jars, for a total of 0.14 oz (18g) of vegetable powders. This kit worked really well for us! We had very vibrant, beautiful colors using our farm fresh light & dark brown shelled eggs. I wish i could upload a photo. Truely beautiful!! Thanks and I really hope it will be back in stock in the future. This dye kit is very handy. I used to make the dyes myself from fruits and veggies but didn't have time this year. The colors are very vibrant, except for the green. It comes out an olive color. Maybe if you let your eggs sit for several hours the color might deepen. Also, the dye is not completely color fast, which means if you refrigerate your eggs and condensation forms, the color runs.